Three has been the “magic number” for Schoolhouse Rock fans for the longest time, but apparently there is a new number in town. For those looking to stay healthy but still incorporate snacks throughout their day, 100 has become the new favorite. Plenty of mainstream food brands offer their 100 calorie “snack packs” but you can just grab some fresh fruits or veggies in the right portions and create magic of your own. What is your favorite 100 calorie snack? 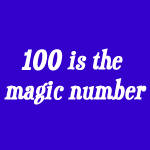 Why is 100 the magic number? Perhaps because it’s simple, nice and well-rounded? I do like it though, because if I’m extra hungry and I eat two packs and not feel too guilty! I do need to create some of my own snack packs. I haven’t bought any for a while–just grab a handful of almonds and call it good! © Dana Lardner and Words to Sweat by, 2009 - 2016 Unauthorized use and/or duplication of this material without express and written permission from this site’s author and/or owner is strictly prohibited. Excerpts and links may be used, provided that full and clear credit is given to Dana Lardner and Words to Sweat by with appropriate and specific direction to the original content. Copyright 2009 - 2016 Whimsical Walney. All rights reserved.